Riverine bottom is an ACFHP priority habitat in the North Atlantic, Mid-Atlantic, and South Atlantic subregions. Riverine bottom habitat includes the benthos of higher gradient headwater tributaries, lower gradient tributaries, higher and lower gradient large mainstem rivers, and low order coastal streams. It also includes non-tidal freshwater mussel beds, coastal headwater ponds, and non-tidal freshwater marsh. Riverine bottom is an ACFHP priority habitat in the North Atlantic, Mid-Atlantic, and South Atlantic subregions. 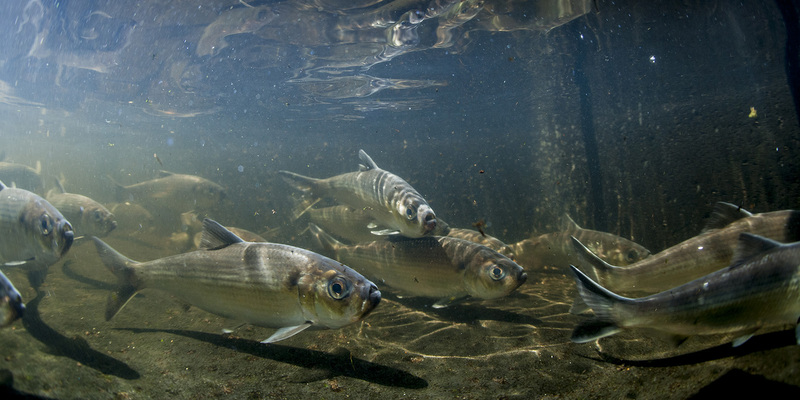 Riverine bottoms act as spawning and nursing grounds for many species, including American eel, river herring, shad, and Atlantic sturgeon. These species migrate many miles upstream to spawn in calmer, safer waters, and, in some cases, their offspring will remain in river systems for their early life stages to mature before migrating downstream to marine environments as adults.1 The sediments also hold invertebrates and vegetation that act as food sources for many fish species. Rivers transport freshwater to marine ecosystems, connecting the headwaters to the coastal shelf, and moving oxygen and clean water through to ecosystems that rely on it. They also create a wide variety of habitat, both in the water and around it, by shaping the land they pass through. 1 Kritzer et al. 2016. The importance of benthic habitats for coastal fisheries. BioScience 66: 274-284. 2 Hall et al. 2010.The historic influence of dams on diadromous fish habitat with a focus on river herring and hydrologic longitudinal connectivity. Landscape Ecology 26: 95-107.